Factory Helps Launch SuperJock Events! 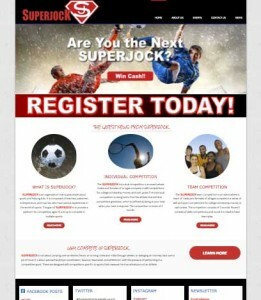 Brand new Website launched for SuperJock Events! SUPERJOCK is an organization that is passionate about sports and helping kids. It is comprised of teachers, salesmen, entrepreneurs, and coaches who have various experiences in the world of sports. The goal of SUPERJOCK is to provide a platform for competitors ages 13 and up to compete in multiple sports. We believe great athletes can play all sports and designed a competition to test that skill. You may not be great at one sport, but being good at multiple sports is a skill that very rarely gets noticed. Athletes will compete in designated soccer, softball, football, lacrosse, basketball, tennis, golf, and softball activities that highlight the athleticism to discover the best athlete, hence the “SUPERJOCK”. SUPERJOCK is fun for all who compete while supporting a great cause. Our mission is to give back to both kids and adults. We want to use athletics as a springboard to help young kids reach their dream of a college education. SUPERJOCK will offer scholarships to help off set the high cost of college tuition for young kids. Adults will have the opportunity to earn cash prizes while challenging themselves athletically. We also would like to provide young athletes with used sporting equipment and lessons that will be donated at each event. The more people who compete, increases the scholarship opportunities and prize money, which allows more kids to benefit from this great cause. Even if winning is not your goal, you can win just by competing and help provide young kids the dream of a college education, sporting equipment or lessons. The website includes online registration and payment and everything you need to know about the event. The Factory Advertising is also hosting the website and handling maintenance and support services for the site. Check out the site at http://superjockevents.com. Follow them on Facebook, Twitter and Instagram! Or better yet, sign up for the event in October! If you are a start-up or existing business looking to maximize your advertising and marketing investment, give us a call and let The Factory Advertising Light Up Your Business!